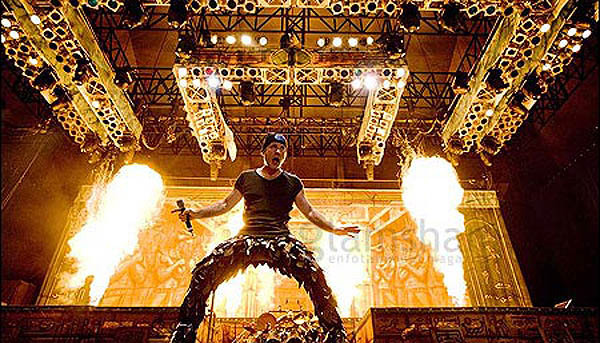 IRON MAIDEN FLIGHT 666 is not just onstage footage coupled with staged interviews. It is backstage, onstage, offstage and everything in between, settling in comfortably with heavy metal band Iron Maiden on their 2008 “Somewhere Back In Time” World Tour, which includes shows in Third World cities rarely visited by a band of their stature, in a personalized Boeing 757 airliner (emblazoned with Maiden’s distinctive razor-edged logo and affectionately dubbed “Ed Force One”) – being piloted by their lead singer! Directed lovingly by Sam Dunn (co-director Scot McFadyen), the man who crafted the thoughtful paean to heavy music, METAL: A HEADBANGER’S JOURNEY (2005), FLIGHT 666 is an in-depth, intimate portrait of this world-shaking band: traveling, soundchecks, holidaying, philosophizing about each other, golfing, drinking, murdering a pizza in the back of the tour bus.. Easily the most incredible thing about this tour is band vocalist Bruce Dickinson piloting the tour plane. He’s been a pilot for years, but performing this round-the-world feat goes beyond imagining. Consider the spoiled brat singers in younger bands who complain that they need rest, or a certain superstitious ritual before going onstage, etc. and here is the singer of extremely vocally-gymnastic songs not just performing the physical expertise of flying a 757, but enduring the psychological and legal nightmare of taking the lives of the whole production in his hands. As bandmate Steve Harris says of Bruce, “I don’t know where he gets the energy.” It’s not just the energy; consider the logistics – the insurance of not just yourself as a band member who has to complete the tour, but the safety of the property, of the lives of those you are responsible for, of the cities you are flying over… It boggles the mind that this endeavor ever got off the ground – literally! Every time the band gets off the plane, they are wearing their usual tour clobber of jeans and t-shirts – and here comes Bruce down the steps dressed in his pilot suit, white shirt, chevrons an’ all! Down to India (the first major metal band to play Mumbai; during soundcheck and show, buckets sidestage for the bug they all caught – the show must go on, troopers all! ), across Malaysia, the Australian continent (“Scream for me, Melbourne!” I love that phrasing of Bruce’s – used it many times myself), Japan, Mexico and South America (Third World cities starved for Maiden’s brand of old school metal – Port Allegra, Sao Paolo, San Juan), USA and Canada… while the spirit of Eddie guards over the plane, a tiny Ed bobble-head on the dash of the plane, a picture of mummy Ed on the plane’s empennage. The gregariousness of drummer Nicko, the loner stylings of 3rd-guitar Janick, the musicality of guitarist Adrian, the sturdiness of guitarist Dave, and the man behind the thunderous hoofbeats of Maiden’s signature style – bassist Steve Harris. Manager Rod Smallwood: “Steve is the musical basis of Maiden – everything gets Steve-ized.” Behind everything, that galloping bass monster. Tom Morello (Rage Against the Machine): “When Steve’s foot goes up on the monitor and he points his bass and starts singing along, I’m gonna be very excited!” You’ve just got to see it to understand Morello’s excitement: the mighty Steve Harris, Fender raised like a machine gun, silently mouthing Bruce’s vocals as he “sprays” the front rows with imaginary shrapnel. How did someone pinpoint that exact awe-inspiring thing that has given us the metal chills since our headbanging youth? In Costa Rica, a golf ball hits drummer Nicko’s wrist – one inch lower and their medic advises they would have all gone home. Makes you once again think of those maddening logistics of medical insurance, travel insurance, medic pay, millions of dollars changing hands, advertising resting on the tour schedule and Bruce’s piloting skills… phew! The crew are cool, seasoned road veterans; seen it all, done it all, none of them the young, long-haired hooligan type – they’re all the sedate and old long-haired hooligan type. One thing about this energetic band, they never make a big deal about groupies and chicks. Maybe now, with their families and kids on tour with them, they’re old enough and wise enough not to make it a feature of their discussions, but they’ve never indulged in wayward groupie talk, even though they came up during the big-haired groupie ’80s. Their docu video 12 WASTED YEARS (1987) comes to mind, a chronicle of the band on the road, where we see manic crowds from which the band could easily have choice pickings – yet, as mum about sexual escapades as Isaac Asimov! Vintage footage of ROCK IN RIO (2002), with Bruce in his snakeskin top, yellow spandex and hair down to arse – funny thing is, he is singing better in 2009 than in 2002. See what piloting a plane can do to your adrenalin? aka: IRON MAIDEN: FLIGHT 666. Directors, Writers: Sam Dunn, Scot McFadyen. 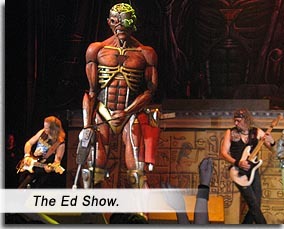 Starring: Bruce Dickinson, Steve Harris, Adrian Smith, Dave Murray, Nicko McBrain, Janick Gers, Rod Smallwood.